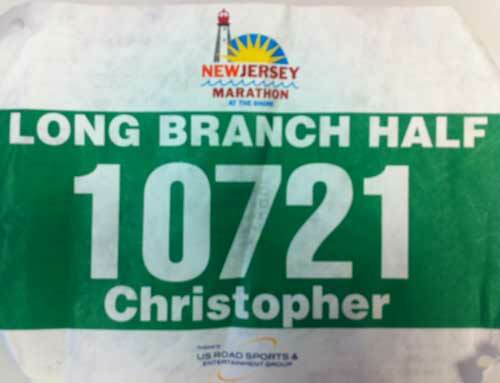 Last year I ran the New Jersey Marathon. It was 90 degrees and it looked like a battlefield by the end, bodies strewn all over lawns, ambulances everywhere. This year I would opt for the Half Marathon. Becoming a tradition, Ed, Jim and I would spend the night at Mike’s (and Kara’s) house in Red Bank the night before the race. The infamous ‘Dad Posse’ and I were ready for some redemption after last year’s inferno. We arrived on Saturday night in time for dinner. Mike took us to a place called Brother’s Italian in Red Bank that’s been around since the 60’s! It was amazing. Family style, it had a huge ‘cafeteria-esque’ dining room with a bar at one end and the kitchen at the other. The tables were full of families dining and most of the kids had on soccer or baseball uniforms from the afternoon’s local games. The interior walls were covered in wood paneling and all things Italian… flags, paintings, photos. Waiters were moving massive amounts of food out of the kitchen with speed and precision. Arriving at a white and red checkered 4-top, our 80 year old server (not even kidding) presented us with the laminated menus. She was really sweet and I wanted to help her carry our plates out when they were ready. Her sweet exterior masked a tough interior, probably hardened by years of dealing with Red Bank, as she quickly got our drink order and moved on. I ordered the lasagna for my pre-race meal. Due to the giant mass of melty cheese involved with it, it maybe wasn’t the most logical choice, but it was delicious! Mike also insisted we get the ‘cheesy bread’ as an appetizer, therefore making it official, dinner, was sponsored by cheese. Back at Mike’s, we all wound down and were in bed around 10:30 PM. I woke up naturally (unaided by an alarm clock) at 5:30-6:00AM and could smell coffee. I had a flashback to that 80’s Folgers commercial where the mom wakes up from the coffee smell then comes downstairs and her son is home for the holidays, back from the military. That did not transpire, instead I quietly sipped coffee in the kitchen waiting for the guys to wake up. We all fueled in our own ways. A few of the guys had bagels, or cereal. Since I was stuffed from my cheese dinner I opted for a banana. Kara had offered to drive us to the start which was a 10 minute drive. We were geared up and out the door by 7:15, excited as the weather was perfect. After our drop-off we had a short walk along the boardwalk to the start. We discussed our goals and what our training had been the last month. 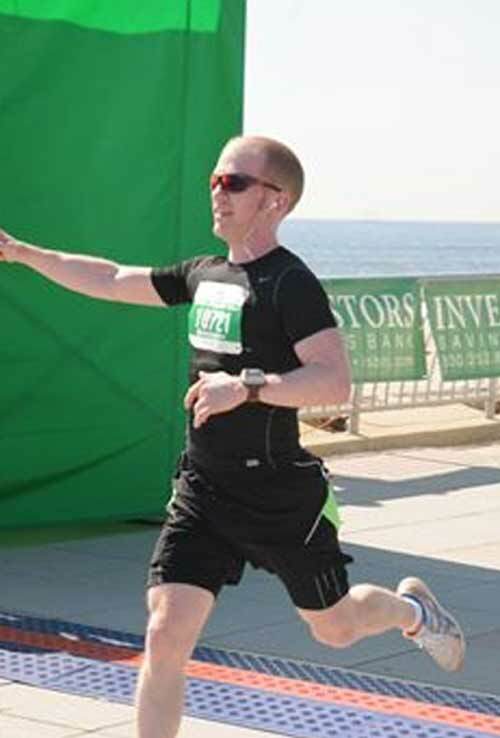 Personally, my goal was to gain redemption from my ‘stomach virus run,’ aka the NYC Half Marathon a month earlier. That would mean running a sub 1:28 and not puking my guts out before the race. I was already ahead of the game with a full and happy stomach at this point. As far as training goes I felt very confident. Coach S has had me doing roughly 2 workouts a day, 6 days a week. I have also been skateboarding to work again, so… whatever that does. She also has me doing limited speed work, so I was very excited to put the pedal to the metal and feel some burn. I separated from the guys and jumped into the corrals. 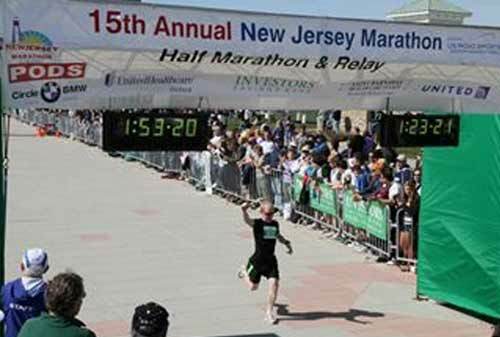 SIDENOTE: The NJ Marathon and Half Marathon do not have pace based corrals. It’s one giant corral and can be a headache. 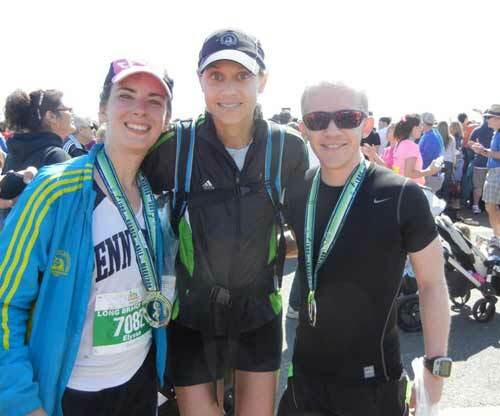 I was pretty sure I was in the front 10% – 15% of the runners and wasn’t stressing. 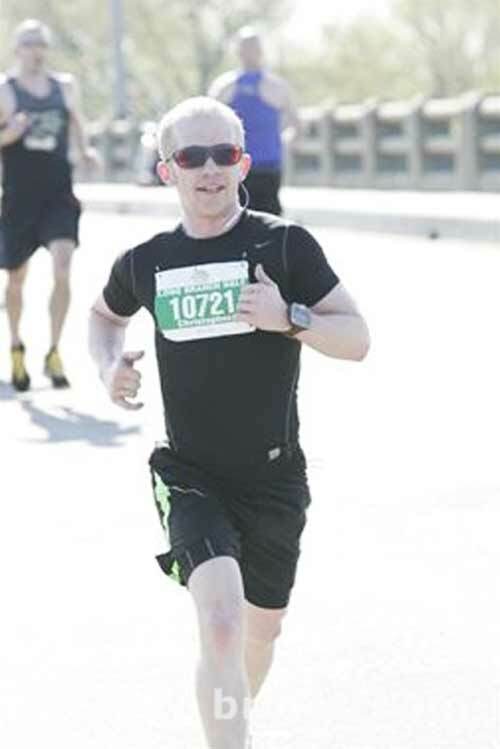 I’m always out for a PR, but I was anticipating bumping into the slower Marathon runners who had started 30 minutes before us, so was just out for some fun. Waiting for the start, this gal in front of me turns around and is like “Baker!” It was Elyssa and Eissa! (aka Team E) I get so excited seeing The Runner Army! We chatted and had a few laughs before setting off on our runs. Miles 2-4 were great as the field really opened up and I was running with just a few others and was pushing my speed. Splits 2 – 4: 6:15, 6:27, 6:16. As we entered the bridge (the only hill) for the out and back loop consisting of miles 4-8 I saw Amy again! I remembered this part of the course from last year and knew once I got back to the bridge it was over the halfway mark. By now I had caught up to the slower marathoners. I was flanking them on the left and it was going just fine until we hit the bridge. At this point the slower half marathoners were coming across so it was jam packed with people all the way across. I basically ran down the center line of the road. It was a lot like running head first into traffic or something. Splits 5-8: 6:12, 6:12, 6:09, 6:10. The second half of the course is roughly straightaways. I was busy on the left again trying to push forward. 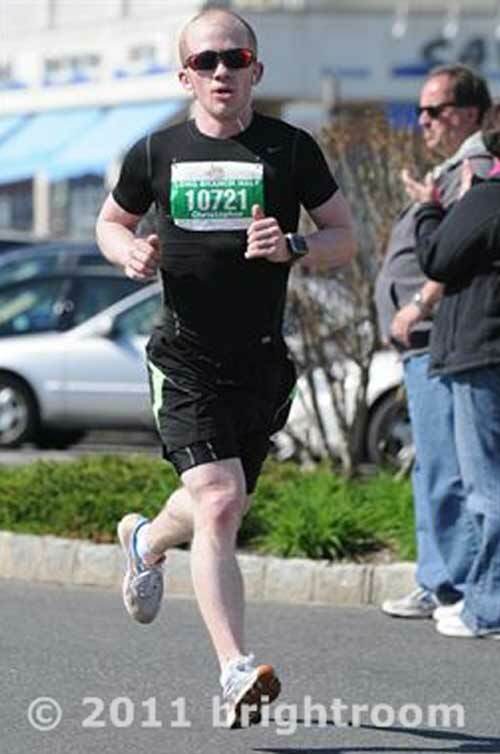 I felt really good at this point and started ‘tracking down’ half marathoners. By now I was starting to catch up to some people who passed me early on and were fading. The sun was high in the sky now and the heat was on. It was here that I realized that I think I run better in the heat as opposed to a nice 45 degree running day. Strange I know. It was at this point that I was doing some rough ‘Baker math’ in my head which is often wrong. Last week I told Coach S I swam a 300 YD Time Trial Swim in 5:98. That’s right, in my world it take 100 seconds to equal a minute. Anyway, I had hopes of possibly making a PR on this course. Since half mary PR is 1:20 and change, I would just have to shave some time off the last few minutes. Easier said than done. Right after mile 11 the course splits and the marathoners take a right to start another loop, while the half marathoners head left toward the boardwalk. As I made that turn it got very quiet. There were 2 guys ¼ mile in front of me and I thought “There is no way I am gonna catch them in under 2 miles!” I made an attempt at another speed push but I was pretty tapped at my 6:15 pace. Also, now that we were on the beach the sun was beating down on us. As I came down the final stretch I picked it up a little bit and finished feeling great! Splits 11 – 13: 6:15, 6:17, 6:21 and a 0.1 blast of 5:53. 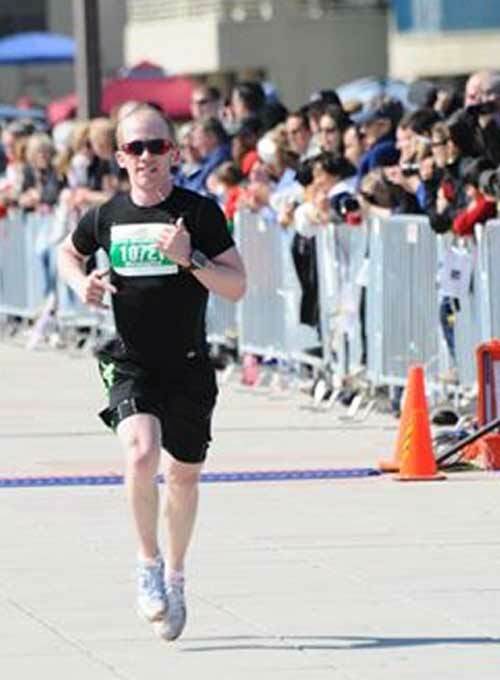 My final time was 1:23:01, my second best half marathon time. I was very happy. 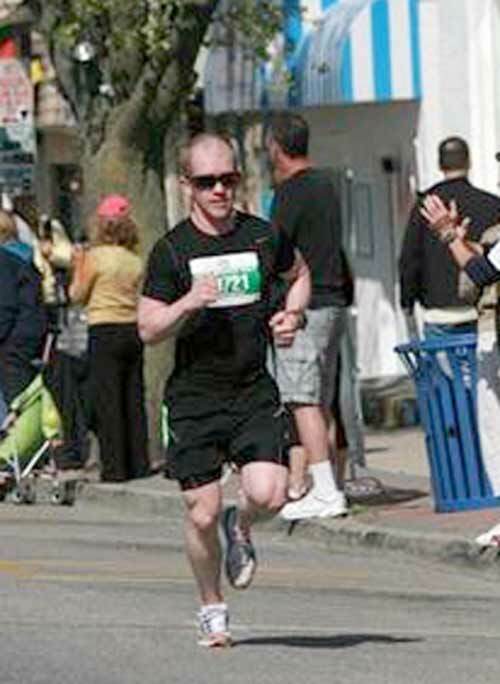 I immediately went down to the finish line and cheered on the rest of the runners, waiting for my gang to come through. I saw Elyssa and Eissa come through and yelled quite loudly, startling other spectators. Sorry, I was amped. Jim, Mike, (who had a serious 20 minute PR! Congrats Mike!) 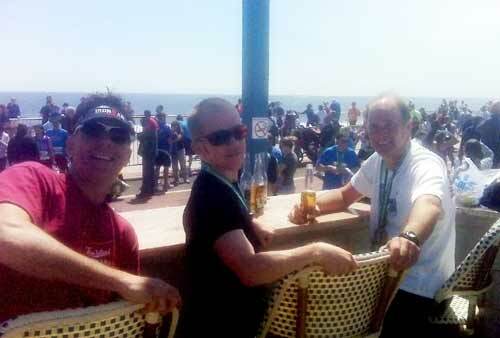 and Ed all came in and we made a group decision to hit the outdoor bar at the finish. We rolled up to this packed bar and by some act of divine runner intervention a handful of seats opened up right in the front at the best spot! We hung out celebrating in the warm weather cheering on everyone while feasting on what my Kung-Fu Master used to call ‘Magic Water’ aka Coronas. I saw Joe at one point and he came over for some high fives! Runner Army represent! We ended the day back at Mike and Kara’s place for a backyard BBQ! Thanks again for hosting us! Back in New York, Abbe insisted she take me out in celebration of my race. Celebrate? Me? Ok. We went to Cask and then to Penelope for some light salads. My appetite was really off after the race, but a salad was exactly what I needed! « Bridges Run with Baker’s Mom!